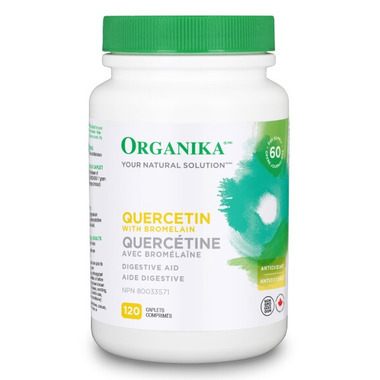 Organika Quercetin with Bromelain is a digestive enzyme that improves nutrient absorption. It acts as a capillary and blood vessel protectant for improved circulation and is a potent source of antioxidants for reduced oxidative damage to skin, tissues, and organs. Directions: Take 1 to 2 caplets per day with meals and a glass of water. Caution: Consult a health care practitioner prior to use if you are pregnant or breastfeeding; have gastrointestinal lesions / ulcers, are taking anticoagulant agents, anti-inflammatory agents or antibiotics; or before having surgery. Hypersensitivity / allergy has been known to occur, in which case, discontinue use. Nausea, vomiting, and diarrhea have been known to occur, in which case, discontinue use (and consult a health care practitioner). I have been using this for a couple of years. I fund it helps my breathing, and is great for me.